The APM National Conference for Women in Project Management 2017 was a great day for all who attended with Keynote speaker, Dr Maggie Aderin-Pocock MBE setting the tone for a host of interesting presentations including; The progressive project professional: what does that look like? Stream presentations: Career challenges, Broadgate Suite 2 Delivery (sponsored by Hyde Park Solutions), Broadgate Suite 1 Demystifying Agile, London Wall Suite and Catherine Holmes and Steph McGovern closing the day;. Delegates from HPS found the event engaging and empowering. “I enjoyed Maggie’s speech the most. It was engaging and empowering. Maggie was enthusiastic and what she said was relatable on a level. Even though I have no ambition to fly into space she made it seem possible for me if that’s what I wanted. For me her having dyslexia was an inspiration as it is always seen as something to hold people back and sometimes used as an excuse but its not when you really know what you want and work hard to get it,” said Laura Smith. “The highlight for me was the second session on Demystifying Agile .It was extremely informative with hands-on pointers and both Gary and I left the session highly motivated to adopt certain components of the methodology.” Thought Daleen Strydom from HPS. 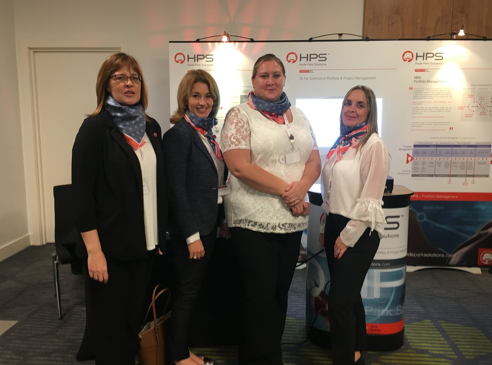 HPS strongly support women in project management and look forward to more events of this kind.